Overview of the 2014 Subaru XV Crosstrek 2.0i Premium available in Southfield near Troy, MI, from Glassman Subaru. This is the crossover SUV for you. The 2014 Subaru XV Crosstrek 2.0i Premium has all the well sculpted, lean and mean looks that befits this urban-based off-roader with all the versatility, comfort and style you expect in a Subaru. With standard all-wheel drive, awesome handling and great fuel efficiency, the 2014 Subaru XV Crosstrek 2.0i Premium comes with notable standard features that include a windshield wiper de-icer, heated front seats and a six-speaker audio system. Configure your 2014 Subaru XV Crosstrek 2.0i Premium in five-speed manual or continuously variable automatic transmission (CVT) to round out your own combination. Order yours today. The 2014 Subaru XV Crosstrek 2.0i Premium is the entry-level trim level model of the five-passenger crossover, the others being 2.0i Limited, Hybrid and Hybrid Touring trims. Standard equipment in the 2014 Subaru XV Crosstrek 2.0i Premium includes air-conditioning, full power accessories, cruise control, tilt-and-telescoping steering wheel, heated front seats, 60/40-split-folding rear seat, Bluetooth connectivity and a six-speaker audio system. You also can opt for a sunroof and a special package that will upgrade the 2014 Subaru XV Crosstrek 2.0i Premium's audio and navigation systems. Sale to Troy from Southfield, MI. No doubt about it, the 2014 Subaru XV Crosstrek 2.0i Premium is quite a looker, sure to turn heads as you drive it down the thoroughfare. 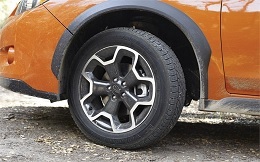 Standard exterior features in the 2014 Subaru XV Crosstrek 2.0i Premium include 17-inch alloy wheels, roof rails, heated mirrors and a windshield wiper de-icer. Optional equipment in the 2014 Subaru XV Crosstrek 2.0i Premium includes a sunroof and other features certain to only add to the five-passenger crossover's already impressive credentials. Powering the 2014 Subaru XV Crosstrek 2.0i Premium is a 2.0-liter horizontally opposed "boxer" four-cylinder engine. The horizontally opposed "boxer" engines that Subaru places in its Crosstreks are called "boxer" because their cylinders are arranged horizontally and opposed to each other, with the pistons moving much like a boxer punching, hence the name. The boxer engines' low center of gravity enhances handling and, thereby, improves fuel efficiency. The 2014 Subaru XV Crosstrek 2.0i Premium's engine produces 148 horsepower and 145 pounds per foot of torque. This engine is mated to either the standard five-speed manual transmission or the optional CVT. The 2014 Subaru XV Crosstrek 2.0i Premium's continuously variable automatic transmission (CVT) is one option that really carries its weight. The 2014 Subaru XV Crosstrek 2.0i Premium equipped with CVT is configured with its own all-wheel-drive system that will send more power to the front wheel under normal driving conditions but will direct more power rearward when a need for traction is detected. 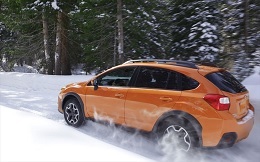 The CVT also is the best option to help maximize the 2014 Subaru XV Crosstrek 2.0i Premium's fuel efficiency while still enjoying a confident, composed ride and drive, even during challenging driving conditions. There's no doubt about the peace of mind that comes with the Subaru name and the automakers renown commitment to driver, passenger and vehicular safety. 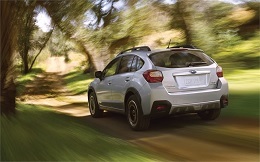 Subaru invests its 2014 Subaru XV Crosstrek 2.0i Premium with a variety of active and passive safety systems. 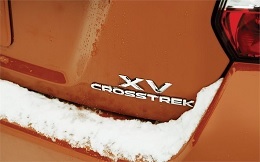 There's also a good number of standard safety features in the 2014 Subaru XV Crosstrek 2.0i Premium. These include stability and traction control, antilock disc brakes, front side airbags and side curtain airbags, driver knee airbag and active front head restraints. The optional navigation system in the 2014 Subaru XV Crosstrek 2.0i Premium brings on board a rearview camera. *The above information is regarding the base model 2014 Subaru XV Crosstrek 2.0i Premium. Standard specs and features may change from year to year. Contact Glassman Subaru with any questions regarding the new or used Subaru XV Crosstrek 2.0i Premium you're inquiring about.